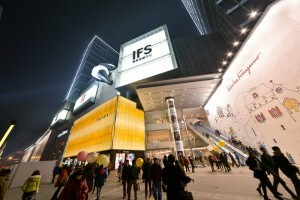 Occupying the most coveted location within the core business district of Chengdu, at the prime junction of Hong Xing Road and Dacisi Road, Chengdu International Finance Square (IFS) has opened and ushered in a new chapter for western China. 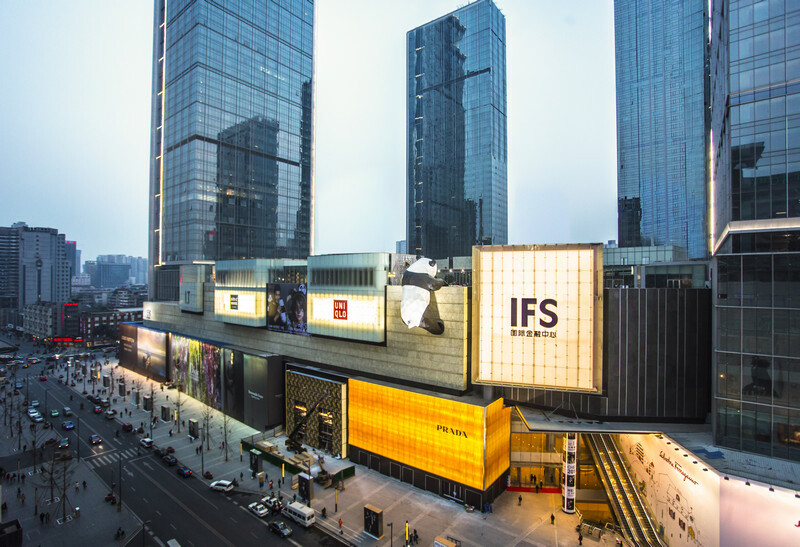 Currently the largest project under operation in the city, Chengdu IFS holds an unrivalled position as Chengdu’s newest commercial real estate landmark. Staging its grand opening in January, the flagship scheme has been welcomed as a world-class, one-stop destination uniting retail, dining, business, leisure, entertainment, living, culture and art. With a gross floor area exceeding 760,000m2, Chengdu IFS delivers the ultimate in high-end, mixed-use destinations. Conceived as a ‘City within a City’, the development integrates four main components – a 210,000m2 flagship retail podium, premium international Grade A office buildings, a five-star hotel, and luxury residential properties. Behind the scheme is international, award-winning firm, Benoy. Appointed as the Masterplanner, Architect, Retail Interior and Graphic Designer for the development alongside Tower Architect, Kohn Pederson Fox Associates, Benoy set about establishing a new benchmark not only for the city, but for the region. “Western China is undergoing an exciting transformation at the moment, and Chengdu is recognised as the new gateway to this area”, explained Ferdinand Cheung, Design Director at Benoy. 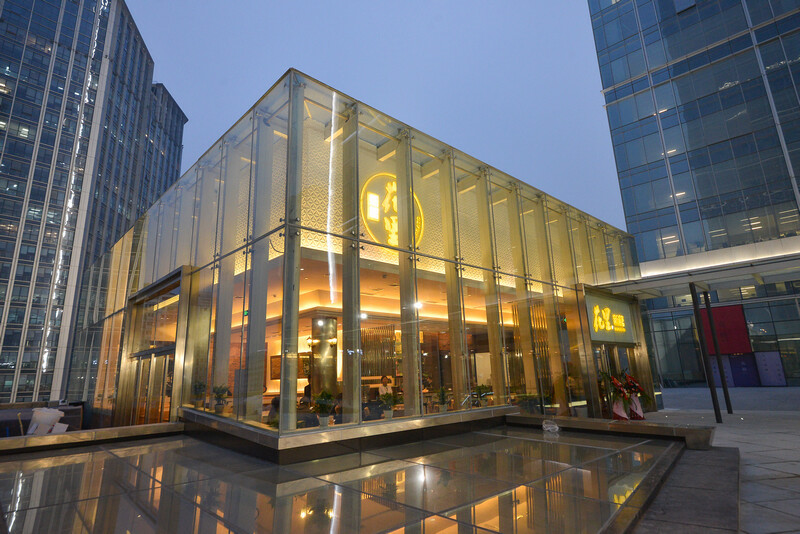 “Our aim was not only to make a successful mixed-use development, but also to design a new lifestyle and memorable destination for Chengdu, which we feel we have achieved”. 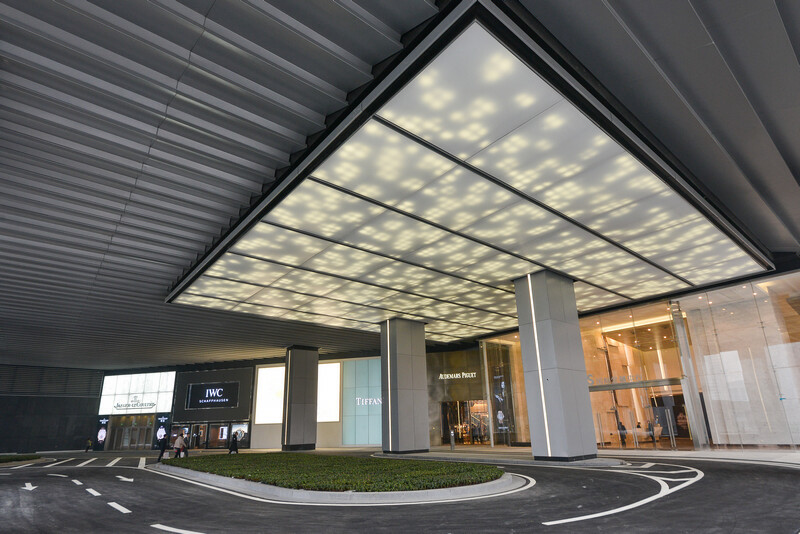 Covering six levels and two underground levels, the flagship retail development has attracted an international collection of luxury, fashion, lifestyle and jewellery brands. Of these, 90 are making their debuts in the city including Chanel, Balenciaga, Burberry, Christian Louboutin, Dior & Dior Homme, Giorgio Armani, Tom Ford, Valentino and Van Cleef & Arpels. The development will also house the world-renowned Lane Crawford Department Store and UA Cineplex (IMAX), bringing nearly 300 stores to the commercial district along Hong Xing Road. “The design for the sweeping and luxurious interiors was inspired by our desire to introduce new innovative design ideals seen in capital cities across the world and inject a level of indulgence and timelessness to the whole spatial experience”, explained Ferdinand Cheung. “Taking a holistic approach of integrating architectural with interior design, we wanted to complement and showcase the collection of international tenants, and make a bold statement for Chengdu”. Continuing its promotion of retail exposure within its architectural design, Benoy has delivered a striking statement along the main façade. Facing out over the ‘urban edge’ of the development, along the lively Hong Xing Road, Benoy has produced feature ‘pop-out’ boxes, forming intriguing spaces for concept retail stores at the terrace level. Topping China’s ‘new first-tier cities’ chart, Chengdu presents a unique commercial and retail attraction. Ranked third on the Forbes list for highest luxury goods expenditure and known as the ‘forth fashion city in China’, Chengdu has a strong consumption power and demand for luxury retail destinations. The development as such has positioned itself to revolutionise the commercial marketplace of Chengdu. The city also has a deep historical and cultural setting, one which Benoy has aimed to reflect and amplify in its design. Chengdu is a booming hub for the contemporary arts scene and vital cultural centre. Home to many prominent artists, the concept for the development was to promote the rich experiences of the city and inspire the public. 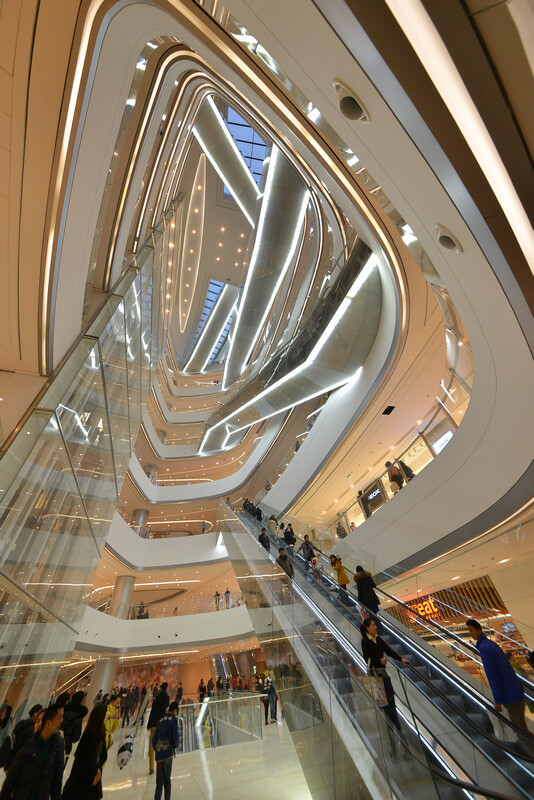 Architecturally, Benoy has extended the spirit of the street and the cultural life of the city into Chengdu IFS. Crowning the retail podium, the Sky Garden offers an urban oasis for shoppers, workers and residents of the scheme. The vibrant green space is enlivened by its Sculpture Garden displaying works by avant-garde and influential artists, a bustling alfresco dining scene and an Art Gallery. “The concept forms a desirable venue for leisure, entertainment, and recreational uses”, commented Benoy’s Project Director, Brady Siu. “It nurtures the city’s cultural life and appreciation for the flourishing art scene by hosting exhibitions, performances and activities”. Connecting with the city’s historic roots, an Antiquity Plaza (water supply system of the Tang Dynasty and horse-drawn carriage boulevards of the Song Dynasty) is a feature for visitors on the first floor – capturing Chengdu’s importance as one of China’s oldest cities. 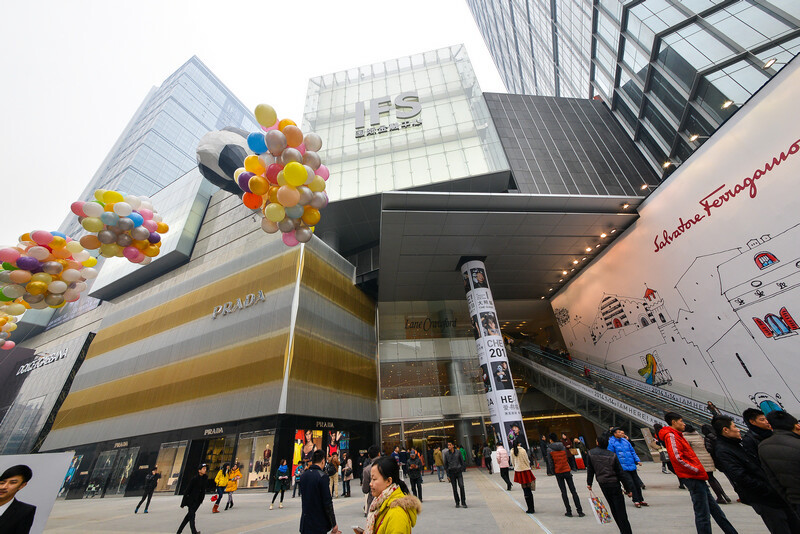 The first of five projects being developed by Wharf Holdings Limited in China, the official opening of Chengdu IFS aimed to attract attention around the globe. With a cross-over art and charity event run in conjunction with the launch, the development has put itself on the map – outwardly displaying the scheme’s commitment to establishing a memorable destination for western China. 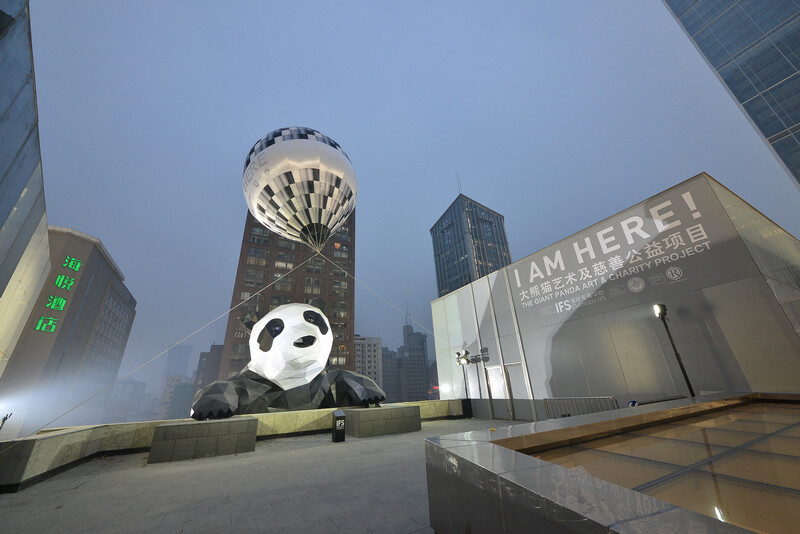 With Chengdu recognised as the home of giant pandas, Wharf Group commissioned world-renowned artist, Lawrence Argent, to build a giant panda art installation for the grand opening to raise awareness for the protection of the animals. The temporary installation, weighing 13 tonnes, appeared to scale the main façade the development, popping its head over the terrace level and becoming part of the Sculpture Garden. “Benoy has achieved what we aimed for in designing Chengdu IFS”, concluded Ferdinand Cheung. “Embodying the changing face of retail around the world, this development has been designed as a city within itself, offering diverse experiences and establishing an identity tailored for Chengdu”.